Ligonier Living: Oh, man, does this look good! Oh, man, does this look good! In between antiquing along Ligonier, PA's route 30 West, set down your stash of milk glassware and rest your bargaining chops to envelope yourself around a filling meal at Fat Daddy's Place. On the outside, this daddy-o comes off looking like granny's little brick house, but inside, it's a lively pub and grill festooned with tin beer signs and without further ado, trinkets, posters and plaques celebrating Western PA sports teams. Read more on Romancing the Scone. I have to stop in here on my next trip to Ligonier. Can't believe I've missed this place! Any help on the location on 30? Hi, CL! If you are coming to Ligonier on Route 30 from Latrobe, pass the Giant Eagle on your left and keep your eyes peeled. Fat Daddy's will be on your left next to PeeWees Ice Cream. You'll need to go up to the light at the fort and do a U-turn to get back to the restaurant. 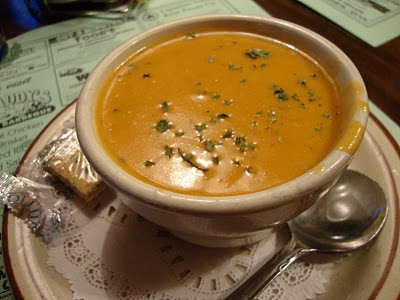 Hot soup sounds good on such a cold winter day!